High-level hoist doorways (Teagle openings) are particularly dangerous situations. Traditionally these have been provided with removal chains or bars across the opening and latterly the operator has been furnished with a safety harness. Safety professionals say these solutions are unsafe as even safety harnesses don't work as operators don't bother to wear the harness. 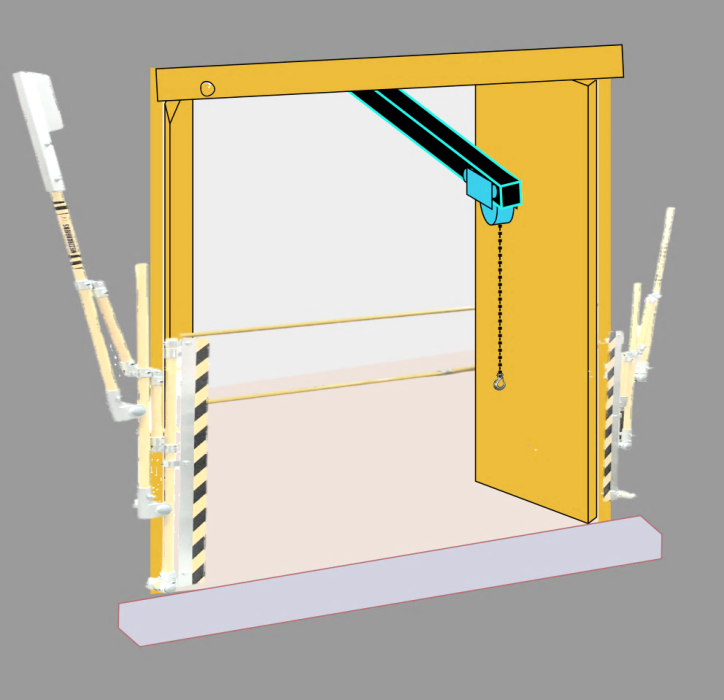 Specially adapted Hi-Gate model for use in Teagle hoist openings with inward opening doors. Designed to permanently secure loading area whilst allowing access by an overhead hoist. The Hi-Gate open top model integrates perfectly with hoisting operations. The ergonomically counterbalanced gates make for an easy, effortless operation and the system is fitted with an anti-slam damper for operator safety. And, it can be configured to allow loads to move straight back into and through the landing area. 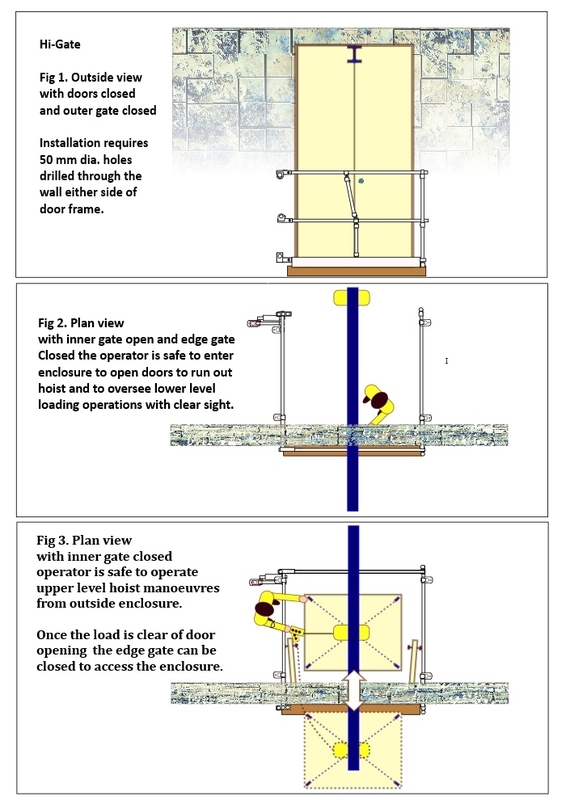 The safety gate system can be installed with inward opening double doorways with a hoist runway. The operator opens the inner gate which allows the operator to open the doors within the safety enclosure. The outer gate is now automatically in the closed position. Once the load is raised operator returns through the inner gate and closes it. The mechanism will automatically open the edge gate allowing the hoist and load to travel in or out of the safety zone. Opening the inner gate allows the operator to continue travelling the load or safe access to lower the load for access. Bespoke dimensions to suit site requirements - Maximum inside width up to around 3000 mm subject to runway height clearance. A low pivot model is available which reduces clearance height. Maximum enclosure depth 2000 mm. For even lower headroom requirement you can consider the Sigma model. Installation instructions are provided. This requires a minimum of 50mm Dia holes drilled through the wall on one side of the door opening for mechanism tubes. For the barrier rests on the other side of the opening, a further 2 holes can be drilled for crutch support brackets or we can provide external bolt-on brackets (Subject to wall construction). Full dimensions of the Hi-Gate or Sigma for hoist doorway application please contact our Mezzbarriers team.